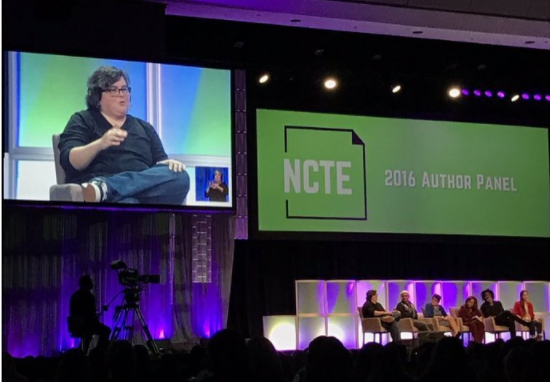 So every time I go to the NCTE conference, I hope for three things: a session where I learn something I can take home and implement immediately; a new book to put into the hands of my students; and a meaningful interaction with new people. This post is how all three of those things converged in one person: e.E. Charlton-Trujillo. After the panel, I went up to the stage to talk to e. because I was so moved by her comments–by everyone’s comments, really, but I hadn’t read her books or, quite frankly, known who she was before the panel. She took the time to chat with me before she had to go on to her next commitment. I vowed to find out more about this remarkable person. Well, not only is e.E. Charlton-Trujillo an author, she’s also a filmmaker and an activist for at-risk youth. At her webpage, BigDreamsWrite, you can see more about her, but At Risk Summer chronicles her unconventional book tour where she “packs her belongings into storage to afford to set out on a book tour to empower youth on the fringe and redefine at-risk in America.” Seriously, the trailer alone will make you cry. 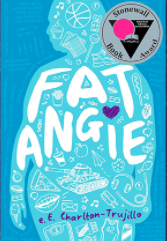 But most of all, this book shows how one young woman struggles to discover who she is and what she is capable of, regardless of what the world, or her family, thinks of her. It is a powerful message, and an engaging story. After I had my book signed, I kept running into e.: at the session to hear S.E. Hinton speak, in the exhibit hall. And she always had a smile, and a conversation for me. When I happened to run into A.S. King, Ellen Hopkins, and Laurie Halse Anderson on my way home through the conference center as they were headed to ALAN, I mentioned e. to them about how awesome she was and how cool it was to meet her and they all agreed. (Also, holy cow, I ran into the triumvirate of awesome.) When I returned from the conference, I was thrilled to see a follow-up email from e.E. with a link to her webpage, because I’d mentioned trying to have her as a speaker at our state conference. Every interaction with her confirmed her as awesome. So read Fat Angie, and all e.E. Charlton-Trujillo’s other books. Watch her movies, have her come speak to your students. She’s inspiring and accessible. And she’s just a kind human being–and we need more of those.